Home » What is insulin? » What is insulin? Insulin is a hormone. It makes our body’s cells absorb glucose from the blood. The glucose is stored in the liver and muscle as glycogen and stops the body from using fat as a source of energy. When there is very little insulin in the blood, or none at all, glucose is not taken up by most body cells. When this happens our body uses fat as a source of energy. Insulin is also a control signal to other body systems, such as amino acid uptake by body cells. Insulin is not identical in all animals – their levels of strength vary. Porcine insulin, insulin from a pig, is the most similar to human insulin. Humans can receive animal insulin. However, genetic engineering has allowed us to synthetically produce ‘human’ insulin. It produces pancreatic digestive juices. It produces insulin and other digestive hormones. The endocrine pancreas is the part of the pancreas that produces insulin and other hormones. The exocrine pancreas is the part of the pancreas that produces digestive juices. Insulin is produced in the pancreas. When protein is ingested insulin is released. Insulin is also released when glucose is present in the blood. After eating carbohydrates, blood glucose levels rise. Insulin makes it possible for glucose to enter our body’s cells – without glucose in our cells they would not be able to function. Without insulin the glucose cannot enter our cells. Within the pancreas, the Islets of Langerhans contain Beta cells, which synthesize (make) the insulin. Approximately 1 to 3 million Islets of Langerhans make up the endocrine part of the pancreas (mainly the exocrine gland), representing just one fiftieth of the pancreas’ total mass. 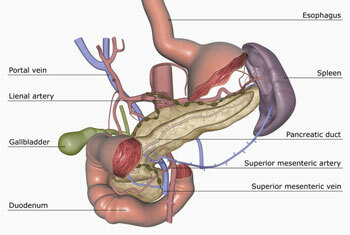 It is said that the pancreas was described first by Herophilus of Chalcedon in about 300B.C. and the organ was named by Rufus of Ephesus in about 100A.D However, it is an established fact that the word pancreas had been used by Aristotle (384-322B.C.) before Herophilus. In Aristotle’s Historia Animalium, there is a line saying “another to the so-called pancreas”. It is considered that the words “so-called pancreas” imply that the word pancreas had been popular at the time of Aristotle, but it had not been authorized yet as an anatomical term. However, the word pancreas presumably has been accepted as an anatomical term since Herophilus. The word pancreas comes from the Greek pankreas, meaning sweetbread. By diabetesdoctors in What is insulin? on December 6, 2012 .